Seoul is a traveller’s dream and there are countless things to do. You can see anything from historic temples to streets lined with high fashion or state of the art technology. You could take the fastest elevator in the world to view the city from the top of the Seoul Tower or you could take a romantic boat ride on the Hangang river and marvel at the skyline. If you are like me however, you would probably want to skip all the touristy areas and see the city on your own. On my last trip to Seoul I accidentally discovered Jae-dong, Hwa-dong and Sogyeok-dong in the Jongno-gu area. I was looking for some buildings, pieces of architecture I saw online and wanted to visit in person. I set out from the Anguk subway station (Exit 2) and continued straight down the street (Bukchon-ro) past the Constitutional court. Just so set the scene, I was in Seoul on the weekend of the Lunar New Year celebrations and it was cloudy, quiet and raining faintly. Having visited other areas in Seoul earlier that weekend I was surprised to find the city a lot quieter than normal – lots of shops closed to celebrate the Year of the Horse. As soon as I turned left into Bukchon-ro 5-gil it was as if I stepped into heaven. A narrow street lined with coffee shops, boutique stores, galleries and small contemporary architectural gems. 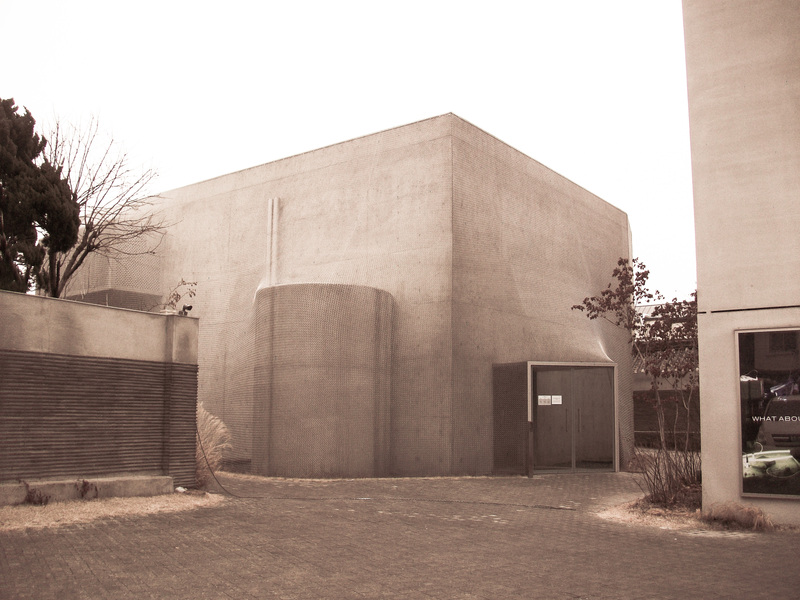 The fist building that I was looking for (Songwon Art Centre by Mass Studies) appeared in front of me and I was elated. The shape of the building takes its cues from the sharp angle of the street corner and I stood admiring the in-situ concrete finish for a while. Another thing that struck me was that the area was crawling with young trendy locals – whereas the rest of the city seemed to be recovering from a hangover. It felt as if I had inadvertently stepped into the coolest place to be – and there were no other foreigners in sight. I continued along the road up a small hill and was surprised to find even more shops on the other side. After I passed what seemed like a park and one of the nicest tourist information pavilions I had seen I turned right into Bukchon-ro 5ga-gil. An even narrower street but still lots of art and design treasures to be found. I was looking for the second item on my buildings-to-see-wish-list (Kukje Gallery by SO-IL). At this stage my urgency to find architecture has disappeared and I found myself being lured into shop after shop finding excuses to buy gifts for people I didn’t even like. I had found the second gallery on my list – a cube draped entirely in a metal mesh curtain. It was a little harder to find than the first gallery, but then all treasures are worth the hunt. Having completed my list I wondered randomly through the streets back in the general direction of Anguk station. It felt as if no matter what direction I take I would surely find something to fall in love with. It started to rain harder and harder so I decided that I would return to my secret place in Seoul to find more treasures some other time. 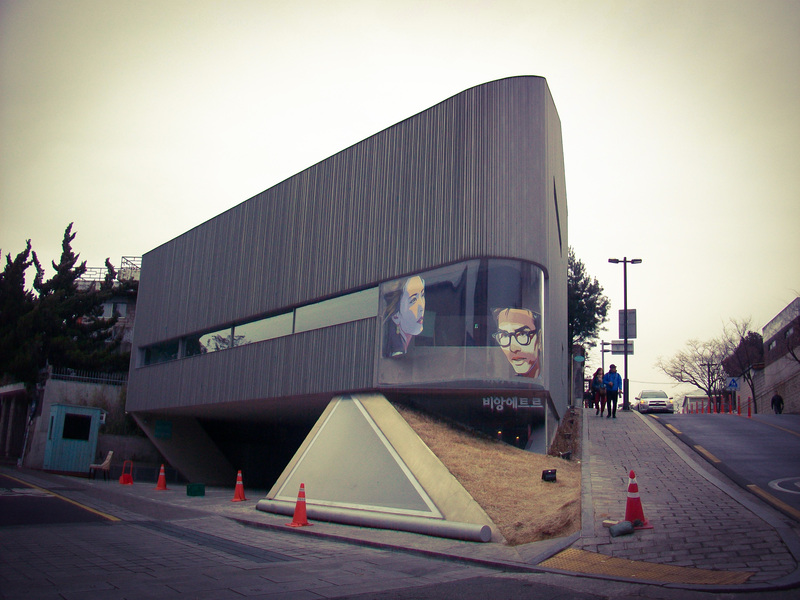 Posted in a flâneur speaksTagged Korea, Kukje Gallery, Mass Studies, Seoul, SO-IL, Songwon Art Centre, travelBookmark the permalink.